The Fossil Bird Collection comprises skeletal remains from the Upper Jurassic to the Pleistocene period. There are overall approximately 3,000 skeletal remains, including 11 types and 250 originals. 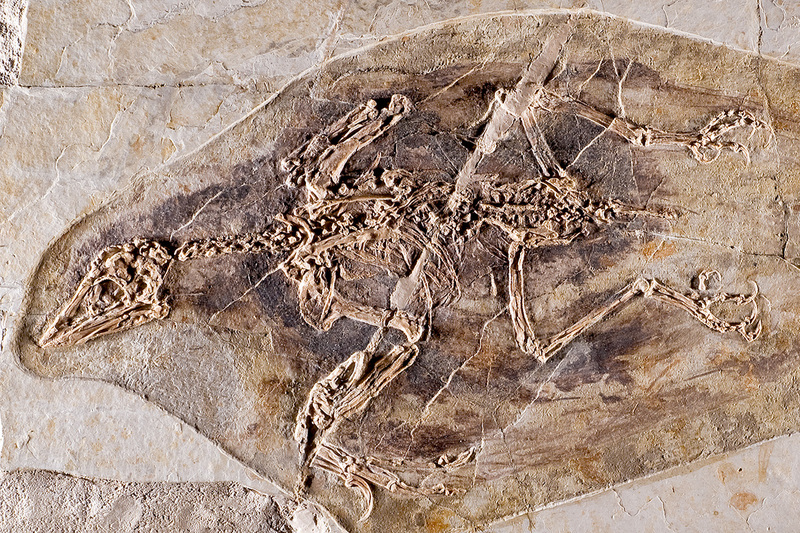 The best-preserved specimen of the famous ancestor of birds Archaeopteryx lithographica was found in the Upper Jurassic limestones of Eichstätt in Bavaria with its counter-slab and was added to the Palaeontology Collection in 1880. Further important items are the remains of Hesperornithiformes, bird fossils from the Palaeogene of Quercy and the Miocene of Sansan in France, the Pleistocene of Cuba and the skeletons of two subfossil moas (Dinornis, Emeus) from New Zealand. In addition to these significant finds, the fossil bird collection has particular value for the European region for documentation, comparison and reference. The collection of fossil birds has been sorted systematically. It is a dry collection, containing mainly fossilised bones and a few subfossil bones. Digital data in various formats are available for Archaeopteryx. The oldest pieces of the collection date back to the Mineralogisches Kabinett of the Humboldt Universität, which was founded in 1810. Some bird remains originate from a famous collection once owned by Ernst Friedrich von Schlotheim (1764–1832), one of the founding fathers of palaeontology. The collection was acquired by the Humboldt Universität in 1833. Remains of fossil moas Pachyornis and Dinornis from New Zealand are also worth mentioning, which arrived in the fossil bird collection with the Hildebrandt collection in 1880. In the 1950s, they were complemented by excavated remains of the giant flightless bird Diatryma from the Eocene lignite of the Geiseltal. Numerous bird remains from the Miocene in France (St. Gérand-le-Puy, Sansan) were purchased for the collection in 1887. With the acquisition of the collection of von Fischer (Hof- und Medizinalrat in Munich) in 1876, a particularly valuable item was added to the collection – a feather of Archaeopteryx found in Solnhofen in 1860. Another highlight of the collection was secured for the Museum in 1877 – the fossil slab and counter-slab of Archaeopteryx. The purchase was mediated by Beyrich and financed by industrialist Werner von Siemens. Later additions to the collection often came from various expeditions, such as by M.D. Selenka to Trinil/Java (1907-1908), which yielded Pleistocene bird remains, or the Kohl-Larssen expedition with ostrich-type birds from Africa. Alongside many other items, the collection of Pleistocene remains from Cuba is significant. These come from an excavation expedition carried out by what was then the Institute for Palaeontology at the Museum für Naturkunde 1967 in Quaternary karst caves in Cuba. Due to its limited size, the bird collection has traditionally never had its own curatorship, but was always allocated to some other curatorship – currently the fossil reptiles. The absolute highlights of the collection are the Archaeopteryx fossils. 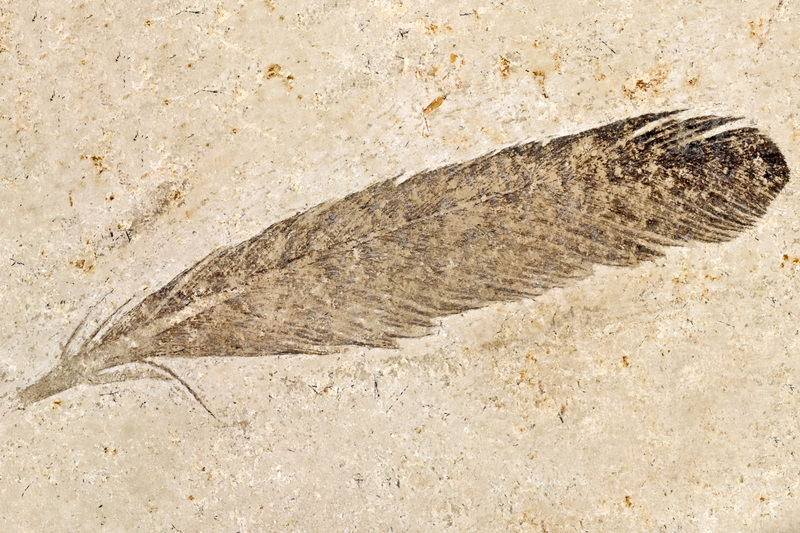 The fossilised feather (MB.Av.100) is the original holotype from which the name Archaeopteryx derives. It was described by Hermann von Meyer in 1861. The Berlin specimen of Archaeopteryx was given a home at the Museum für Naturkunde through the intervention and financial support by Werner von Siemens in 1880. It has been part of the permanent exhibition since 2007. This exhibit is complemented by its counter-slab with extremely well-preserved feather indentations, which is kept in the collection safe. Another outstanding fossil is the completely preserved Confuciusornis (MB.Av.1158) from the Lower Cretaceous of Liaoning (North East China), which was purchased for the collection in the 1990s. Confuciusornis is a genus of primitive relatives of birds that are more closely related to modern birds than Archaeopteryx. The animals were about the size of a thrush and there was distinct gender dimorphism. Some of the animals found have very long paired tail feathers. In the Berlin Confuciusornis specimen, not only the bones, but also the feathers, including the long tail feathers, are well preserved. Most visitors come to the Fossil Bird Collection to see Archaeopteryx. Scientists from all over the world come to Berlin to study the exhibit from ever-new scientific perspectives. As the original is part of the exhibition, studies on Archaeopteryx can only take place on a Monday. Research methods have dramatically changed over the past years. Rather than simple optical reproduction, they now include 3D Laser scan, UV-based methods and even computer tomography. These are all non-invasive methods that are compatible with the preservation of Archaeopteryx. Other specimens in the bird collection are also available for scientific studies. Work places are provided in the collection hall itself. Please direct any queries to Dr. Daniela Schwarz, curator of the fossil bird collection.